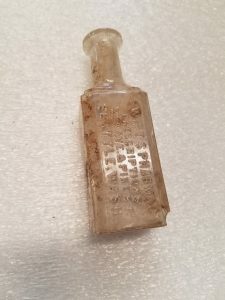 45K1765/P9-13; Who used this medicinal bottle in (aprox) 1892? Some could argue that bolder and more “alcoholic looking bottles” would be more interesting to look at, but in the midst of all these beer and wine containers that were found on what used to be a massive dump for local businesses at 6th ave S, which was sealed in 1929, I find bottles destined for different purposes than being drunk at the end of a long day. Because as we’ve learned throughout this class (especially through feminist archaeology) is that regarding the whole story other than the mere stereotype is essential for holding knowledge as a constructed , shared value. And where am I going with all of this, you might ask? Well, have heard of how Seattle “was like” at the sea line in “the olden days”… If I close my eyes, I can see muddy streets, underground tunnels with gambling and prostitution, bars and hotels filled with people still on their way to the Yukon to test their luck, and mostly a lot of drinking and passing out happening. This might be true, but can also attribute a single face to those working class people who would inhabit those neighborhoods. 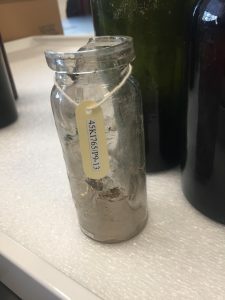 That is why, through the Lag analyze I did on the bottles of my group, and the specific study of this particular bottle, I will try to discern what it was used for (if it was medicinal at all) and who might have used it. 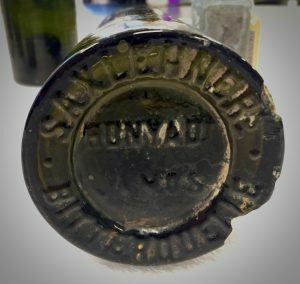 What type of bottle is it and what did it contain? 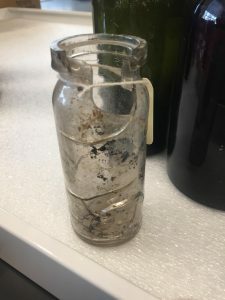 This is a small cylindrical bottle, with colorless and slightly opaque glass, machine made with wide mouth which we believe may have been of medicinal use or in other generations, of miscellaneous use. It most likely held medicine or medicinal plants/pharmaceutical elementary material, but we are not a 100% sure! that is why it is interesting to look at. We believe it was manufactured between the 1880’s and 1930’s, which would give it a mean production date of 1905. We are not sure where it was manufactured since there were no specific signs that could give us a clue. Can you find any information concerning how the product was marketed and/or consumed? There is a valve mark, and the opening of the bottle shows signs of having had a tap that would be screwed on (like a little jam bottle). 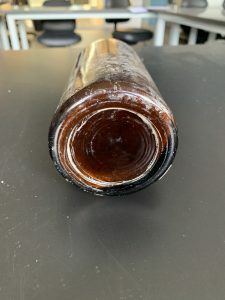 The wide opening of the bottle with no neck visible, gives us the idea that it might not have been used for drinking directly from the bottle, but it must have used to store the content, and then pour it somewhere else. I believe this bottle could have been used in any local business, (ranging from a bar to a pharmacy or a hotel.) Because we are not a 100% sure if it was medicinal or used for other household needs such as holding food, we could imagine that it might have belonged to a business that required a kitchen and perhaps hosting people over, with more equipment than a simple bar. I can’t imagine a single individual carrying it around, it must have been used in a more “touristy” setting! as the F. E. Reed company had manufacturing plants throughout the United States, supplying breweries nationwide with bottles for their beers. 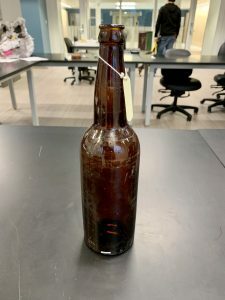 The advent of the fully automatic Owen’s Machine likely helped perpetuate this style of bottle as the dominant beer bottle design, as the same exact bottle could be mass produced at each plant throughout the country. Just like beer bottles of today, the only difference between bottles around the country would be the label that was glued upon them, as time has torn away the label that was once affixed to this particular bottle, there is no way of knowing its true origin, but the magic of this bottle is not in its uniqueness but in its ubiquity. Base and Label details for Artifact 45K1765/P17-1 from Burke Museum’s collections. 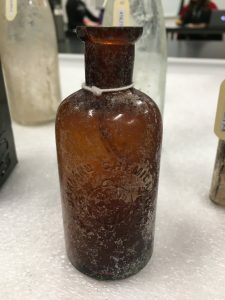 Though this type of soda bottle also resembles what the Illinois Glass Company referred to as a druggist’s packing bottle, the trademarked Hunyadi Janos product was so popular that the bottle shape became synonymous with the brand. The Illinois Glass Company actually offered the “Hunyadi Janos” style bottle for sale in its catalog in 1906. Primarily imported from Hungary to the US from about the 1870s to 1920s, the Bitterquelle’s success inspired a variety of copycat products. At a time when copyright and intellectual property were flagrantly ignored, the Saxlehner Company took its trademark infringement lawsuits all the way to the US Supreme Court in 1900 and won. 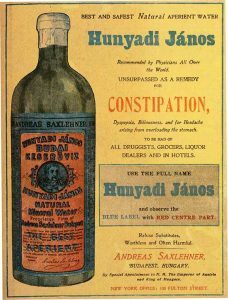 Though ubiquitous in American homes at the turn of the century, Saxlehner’s Hunyadi Janos Bitterquelle faded from popular consumption by the time the the Great Depression took hold. Back in Hungary where the product had been manufactured, growing political unrest before WWII compelled the Saxlehner family to emigrate in 1938. Documentary evidence like advertisements, manufacturer catalogs, and legal records shed light on the historical contexts surrounding the material record. More than just an old green bottle, this artifact reflects cultural, social, economic, and international political scenes of the early 1900s. In examining my bottle, the first inclination was to examine the bottle for a makers mark. This was somewhat helpful. 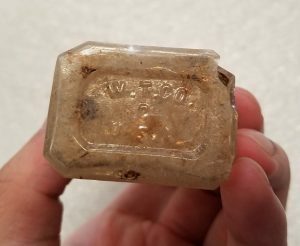 From the makers mark, I was able to determine this was a Whitall and Company bottle produced somewhere between 1901 and 1924. 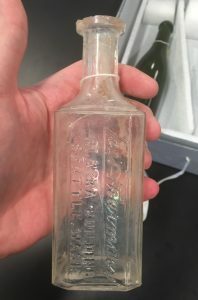 Whittal and Company made this pharmacy bottle for pharmacies across the United States and opperated between 1806-1938 in Millville, New Jersey The real clue to the bottles age however was the embossing on the side of the bottle. The side of the bottle reads, “Lee’s Parmacy Alaska Building Seattle Wash.”. Subsequent investigations led me to conclude the Mr. Lee operated his pharmacy from 1889 to 1914. So that led me to investigate the Alaska Building. 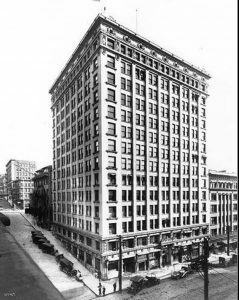 The Alaska Building was Seattle’s first skyscraper. At the time of it’s construction, it was Seattle’s first steel framed building and opened in the year 1904. The Alaska Building was constructed around the Seattle boom around the time of the gold rush in Alaska. 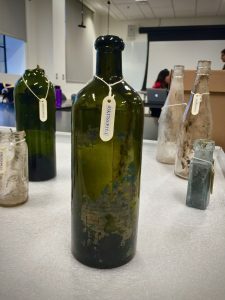 The building can be directly tied to the Seattle gold rush, which makes this bottle an important object from this period in time. 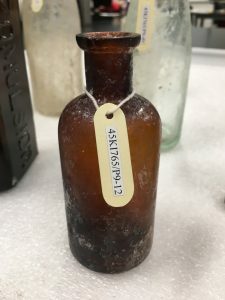 Taking this into account, this bottle was then ordered either before the pharmacy’s opening in the Alaska Building… say an early date of 1903, to the closing of the pharmacy in 1914. I have thus narrowed the dating of the bottle from a 23 year period to an 11 year period taking into account the multiple lines of evidence that this bottle has to offer. Bottle typology is really interesting, I had no idea how accurately you could date a bottle, and how much information is embedded in it’s manufacturing. The bottle I studied was made by the American Bottling Company. It is an aqua colored beer bottle, made in the export style, which was popular during the late 19th and early 20th century for alcoholic beverages. Export style dates back to the 1870s, and is characterized by a bulge in the neck, a body length that is equal or just a little taller than the height of shoulder, neck and finish all combined, and the shoulder is also short and sharp angled. This beer bottle is also a 2-piece post mold, and the base has a pontil mark, and is embossed with, “A.B. Co C 6.” Originally, based on it’s shape, color, finish and style, I dated the bottle from 1870s-1890s. 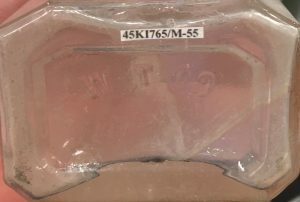 However, after doing a little more digging, I found out the C 6 is supposed to have to do with a more specific timeframe in which it was manufactured, but I could not find any more information as to what timeframe that would be for the specific label. 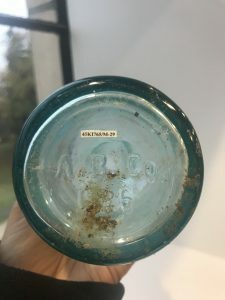 I did find however that American Bottling Company changed their labels pretty often, either how they presented their name, including or not including the location where it was manufactured, the location of the label itself on the bottle, having an ‘X’ symbol, and even combining the ‘A’ and ‘B’ into a single symbol. American Bottling Company was represented on this bottle as “A. B. Co C6”. “A. B. Co” as a base mark means that this bottle was manufactured between the dates of 1905-1914. By the seams on the side that run all the way through sides, and what I assume on the shoulders are seams, I can only imagine that this was molded with a 3-piece mold, one for the top, and two halves for the body. But looking at it again with the seam running all the way to the lip, it’s probably more likely a 2-piece mold. 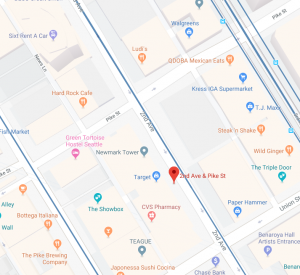 A search of that intersection on the internet will put you a street over from the Gum Wall and right next to Pike Place. Clearly it’s not there anymore and has since been replaced by bigger chain pharmacies like CVS and a Walgreens a block over and around the corner if Target isn’t your fancy. Nowadays the majority of our sodas, medicine and water all come in plastic containers. It’s kind of difficult to imagine a world without the widespread use of plastic. Well before the 1950s that’s exactly what the world was like and instead of plastics we used glass. 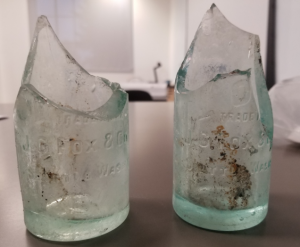 Pictured to the left are the bases and bodies of two glass bottles recovered during the Atlantic/ Central bus base Expansion Project that took place in Seattle between 2002 and 2006. But how can we possibly learn anything from two jagged and rather dirty looking fragments? Well I can tell you with complete confidence that there is certainly more to these shattered pieces than meets the eye. 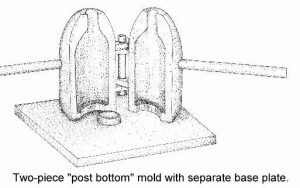 Based on the location of seams on the sides and base of the bottles we know that this was produced using a 2 piece post- bottom mold (see diagram). This type of mold was used between the 1840s and the early 1900s. Therefore, we can assume that the bottles were first produced and used within this time period. Embossed on to the front of the bottles are the words “JG Fox & Co.” This provides us with a wealth of information. A quick google search will reveal that JG Fox & Co was a beverage company based out of Seattle that primarily sold mineral water, sodas and beer. Since beer is usually sold in darker bottles I think it’s safe to assume that this was either a soda or mineral water bottle. In comparison to other bottles within the assemblage these ones were relatively heavy. Therefore, I do not think they would have been carried by people in everyday life. Instead, they were more likely used in a domestic setting, i.e. someone’s home, or in a restaurant. Lindsey, Bill. “Bottle Bases.” Bottle Bases Page, sha.org/bottle/bases.htm. This bottle is an amber colored bottle manufactured using a 2-piece with cup mould and has a prescription finish. 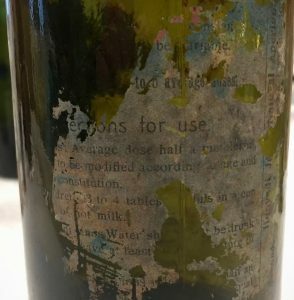 The seams on the sides of the bottle are indicative of this kind of mould. Embossed onto the bottle is the name “The Oakland Chemical Company” with a chemical symbol in the middle. The bottle likely contained what was known as dioxygen or previously, Oakland hydrogen peroxide. 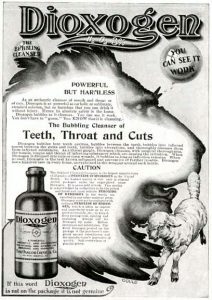 The hydrogen peroxide was marketed as being safe for oral consumption, although today we know it should not be consumed and likely would have burned the throats of people who drank it. 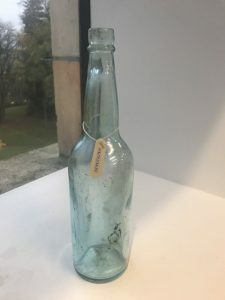 The date of manufacture for this style of bottle (2 piece with cup) is between the 1880s and 1930s, but knowing the company who sold product in the bottle, the date can be further refined to the late 1890s, early 1900s. The headquarters of the Oakland Chemical Company was in the New York City region, moving from Brooklyn to Manhattan and Staten Island. This product most likely would have been found in a household along with other medicines intended to treat ailments.